In ‘Life is a Game!’ Jan Vermeiren succeeds in integrating Emotional and Spiritual Intelligence in a playful and visual way. The insights are clear, experienced by himself and encourage self-reflection. I accepted the invitation to choose to achieve Phase 3 and in that way contribute to a ‘better world for everybody’, with more well-being for all. And you? I love the analogy with computer gaming and the metaphors: monsters, teddy bears, trains, robots… It makes the spiritual content of Jan’s book less airy-fairy. Other books about personal/spiritual growth are sometimes hard to digest or too intellectual. Also Jan’s humour and self-relativation makes this both a very insightful and practical book! Highly recommended! Jan explains in the introduction of the book how he builds further upon the universal/spiritual foundation of his two best sellers ‘Let’s Connect!’ and ‘How to REALLY use LinkedIn’. I’m glad he made that decision. ‘Life is a Game!’ provides practical down-to-earth tips in a high-in-the-sky framework. When you have read the book you will agree with me that this is an excellent approach! I’m glad to see someone from the business world make the connection with the world of personal and spiritual growth. I was expecting a good mix of practical tips, tools and techniques combined with a helicopter view. And Jan more than delivered! Jan was able to capture his eclectic knowledge about the principles of ‘A Course In Miracles’, ‘Way of Mastery’, ‘Teachings of Abraham’ and other sources in simple analogies and examples, illustrated by how he applied this knowledge in his own life. This book lowers the threshold for many of us, who otherwise would not become exposed to these life-changing insights. A highly recommended read for those who feel the impulse to read this book! Dr Tania de Winne, Author of From Headquarters to Heartquarters. Living and Leading from the Heart. Jan has written a comprehensive, well-researched and thoroughly enjoyable book offering practical suggestions on how to resist the ‘bad stuff’ of life and become lighter and more joyful in the ‘game of life’. His humor, in his use of analogies and metaphors (computer games, monsters, teddy bears, trains, robots) creates an easy to read engrossing structure, making it difficult to put the book down. He poignantly shares his personal journey of discovery about becoming lighter and at the same time takes the reader on a detailed journey rich with a wide selection of tools to assist one to move into a gentle life, offering something for everyone. Overall message of the book: it’s your choice to be happy and reading this book will certainly give you a jump-start in that direction. 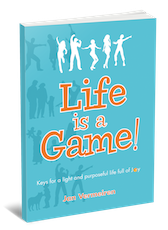 ‘Life is a Game!’ is a great book and a must read if you care about the game of life. By surrounding yourself with positive thinkers and encouraging thoughts, you can achieve greatness. Our thoughts affect our actions. This book will help you realign your priorities and get on the right track for success. Forget the tiring, energy draining and frustrating ‘Struggle for life’! Discover now that ‘Life is a happy and joyful game’ if we understand it and know the rules how to play it. Thanks to Jan’s easy, honest and humorous coaching there is no need to reinvent the wheel. Save yourself a lot of time and just follow in his steps, and benefit immediately from one who walked the path himself. In addition he offers lots of other practical and easy to use tools. Highly recommended! In ‘Life is a Game!’ Jan Vermeiren invites us all to play the joyful game of life in a most understandable and touching way. Of course we all create our own life. Jan transformed from a famous connector to a major human inspirer. He didn’t only lift his own life but will also rekindle your heart once you start reading. Are you ready to play your game of life? What an amazingly courageous book. It is one of those books that I read through in its entirety and will then keep handy to ‘dip’ into every time I feel I’m going off-track or getting sucked into a human game. Two thoughts came to mind as I was reading – one – that we live our lives forward but understand them backwards; and the other thought was that many of our ‘game clues’ are buried in this book. Keep it close by it could save you years of wrestling with yourself! In ‘Life is a Game!’ Jan Vermeiren has made accessible the most essential processes of mankind on Earth in a playful and easy-to-grasp way. And that with very contemporary analogies. We wish you lots of fun playing to become fully yourself!